C is for COOKIES!!!!! These healthy Gluten-Free Chocolate Cherry Oatmeal Cookies are packed with simple ingredients for a delicious snack that’ll help you power through your day! 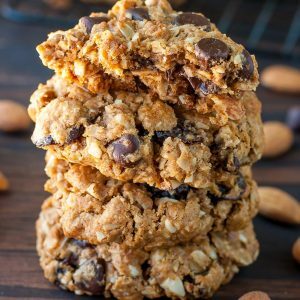 Healthified oatmeal cookies (often dubbed breakfast cookies or workout cookies) are all over the internet, and for good reason too! They’re DELICIOUS! Many recipes call for a heavy hand with the flour (pass!) or using 100% whole oats (which is texturally strange to me – pass!) or hard to find specialty ingredients (passity pass!). 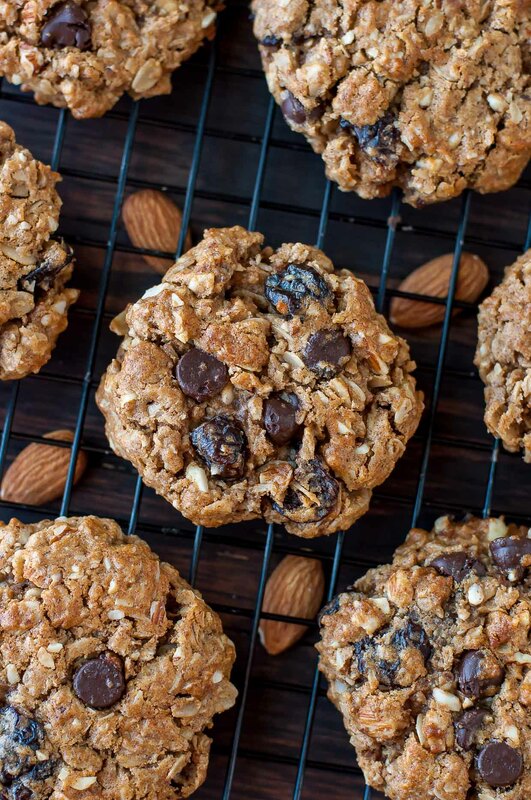 We’re going to skip all that noise and make these healthy chocolate cherry oat and almond cookies with simple, tasty ingredients and a texture that is sure to please! 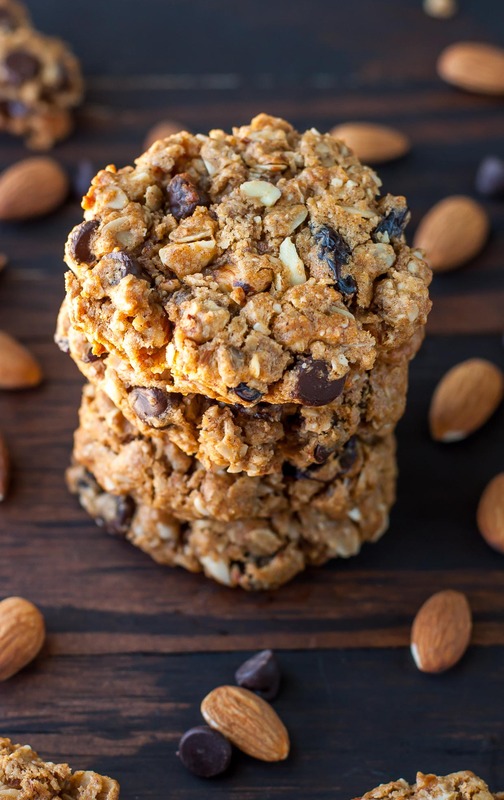 Grinding our almonds and 1/2 the oats in the food processor helps deliver that coveted chunky oatmeal cookie texture with a great soft and chewy center. Buttery avocado oil gives us nice crisp edges, and a kiss of dark chocolate and dried cherries fills each bite with sweetness. These tasty cookies can be stored in an airtight container or tightly wrapped individually for easy snacking. I even sent a few trays of these bad boys into work with the pilot and they were promptly devoured. Love them so! 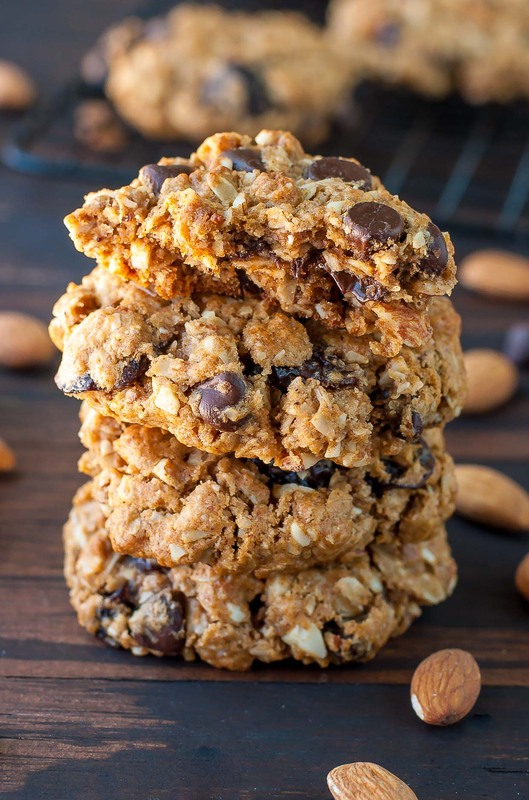 These healthy Gluten-Free Chocolate Cherry Oatmeal Cookies are packed with simple ingredients for a delicious snack that'll help you power through your day! Line a baking sheet with parchment paper + set aside. Using a food processor, pulse almonds until finely chopped/minced and almost flour-like. Transfer almonds to a large bowl and add rolled oats, gluten-free flour, baking soda, salt, and cinnamon. In a large bowl, combine almond butter, oil, honey, brown sugar, egg, and vanilla and mix well with a fork. Fold in dried cherries and chocolate chips using a baking spatula, then mix in the oat mixture. For best results, pop mixture in the fridge for 15 minutes. This is optional but makes the mixture easier to scoop. Use a tablespoon to scoop heaping TBSP of dough (which should be super-thick) onto your parchment paper-lined baking sheet. Spacing each approx. 2 inches apart. 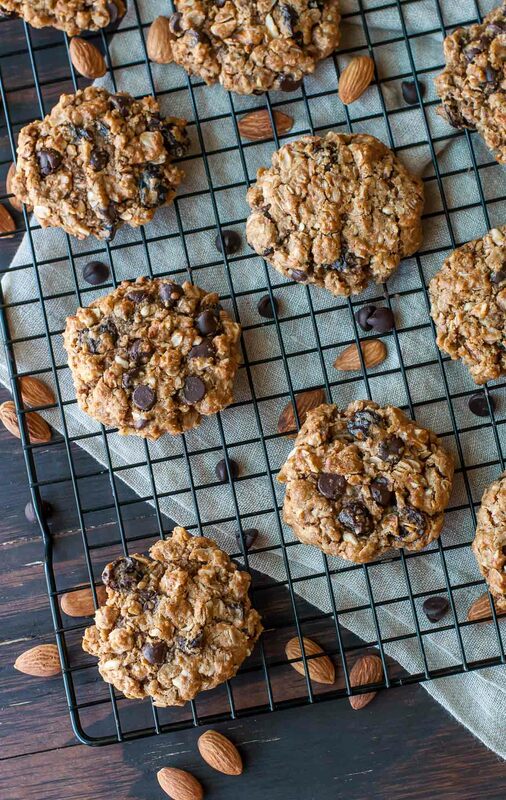 Use a spatula or fork to gently flatten each ball-o-oats into a flat cookie. Allow to cool for 5 minutes on the baking sheet (this helps crisp up the edges and set the shape) before transferring to a wire cooling rack to finish cooling. Complete in 2 batches if needed, allowing the mixture to sit in the fridge while you wait to bake the second batch. Enjoy! In other news… what are you guys watching lately? I nixed cable early last year (the bill was out of control!) and have since fallen in back in love with Netflix. For the longest time I didn’t watch much of anything but now that the chickpea foregoes her afternoon nap, she goes to bed way earlier. Earlier bedtime for the pipsqueak leads to a longer stretch of time for the parentals and we’ve fallen face-first into binge watching shows. So not conducive to our sleep but I’m a bit addicted! We’ve recently become obsessed with The Fall, OA, and Black Mirror. OMG BLACK MIRROR! It’s like a modern Twilight Zone and I can’t get enough. I don’t want to give too much away but there’s a cameo by Jon Hamm and Bryce Dallas Howard and they’re PHENOMENAL. Each episode is 100% stand alone so you can come and go watching them as you please or sit down and tear through 3 in a sitting like Paul and I have been doing. I’m going to be a mess when I don’t have any more to watch. Fingers crossed season 4 is underway! Do you have a favorite show lately? Let me know in the comment section so I can dive into it once I finish up these last few episodes. Much like the story “hangover” I get from finishing a good book, once I realize a show I’m watching is really over I fall into a mini funk until I find something else amazing to latch on to. Actually, throw your latest favorite book at me too — I need something new to read while I scarf these healthy cookies!? These cookies look delish! Love the ingredient list. For books…I highly recommend A Visit From The Goon Squad by Jennifer Egan and Cloud Atlas by David Mitchell. Actually, I love both of these authors but these are two of my fav books! For lighter, fluffier reading, I love Liane Moriarty. Big Little Lies and What Alice Forgot are both so good. There are so many wonderful things happening in this recipe. I don’t EVEN know where to start. I guess whipping up a batch would be a good plan. Then eating, then eating more, then making another batch. I think I found myself a game plan. Thanks! Thanks Courtney! They’re great with coffee so they should be stellar with tea too 🙂 MMM especially a fruity green or a full bodied breakfast tea – swoon!